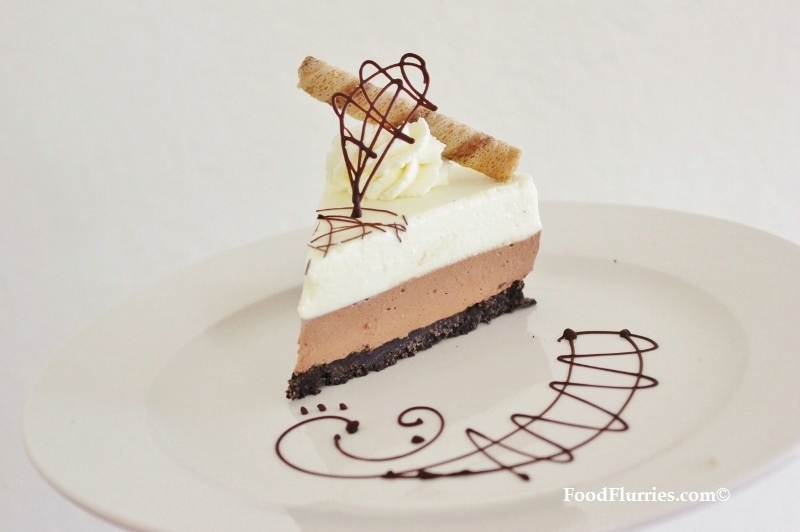 Oooh … I am very excited to present yet another no-bake cheesecake creation today. This one was inspired by Cadbury’s Top Deck chocolate bar. Remember that one? I always thought it was a stroke of sheer genius to put both milk AND white chocolate together in one beautifully packaged candy wrapper. I ♥ the person(s) who came up with the idea. YAY! I wanted to make a cheesecake that was both easy to make and that was pleasing to look at, with some colour contrast. These thoughts kinda drifted and melded; colour contrast soon became thoughts of black-&-white …. and then black and white layers … five minutes later : TOP DECK! This idea was even better than I had imagined coz not only was it going to be awesome with the contrasting layers but it’s also going to be a double-chocolate creation! HURRAH! 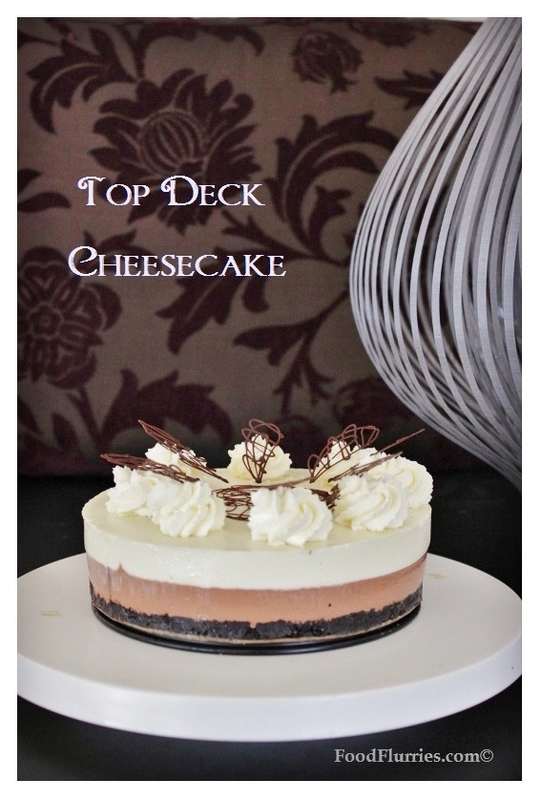 However, after looking at the photos I took I kinda think it needs to be renamed Triple Deck or Triple Choc Cheesecake. So here is what you’ll need. A full packet of dark chocolate cookies (about 12 – 14 cookies) depending on the size of your cheesecake tin. I used an 8-inch round springform pan; lightly greased for easy unmoulding. The removable bottom of the pan was flipped so that the lip would not come in contact with the crust. I found this tip extremely helpful because there has been too many times when I wanted to remove a cake from the botttom tray the off-set spatula could not get under the cake due to the lip of the tray. So do yourself a favour and flip this before you begin your cheesecake odessy. Spray the bottom of the tin with a little PAM and place parchment paper on top. The biscuits were crushed in a food processor and then mixed with melted butter ~ standard cheesecake base recipe. Pat down as best you can. I can never press cookie crumbs up the sides of the tin while maintaining equal thickness all around so I avoid this all together. It just makes me angry and frustrated. However, if you are a cheesecake base whizz, go ahead and line the sides of the tin as well … although you will then need more than a packet of biscuits. After lining and pressing the biscuit crumbs place everything in the freezer to chill while you get the filling ready. 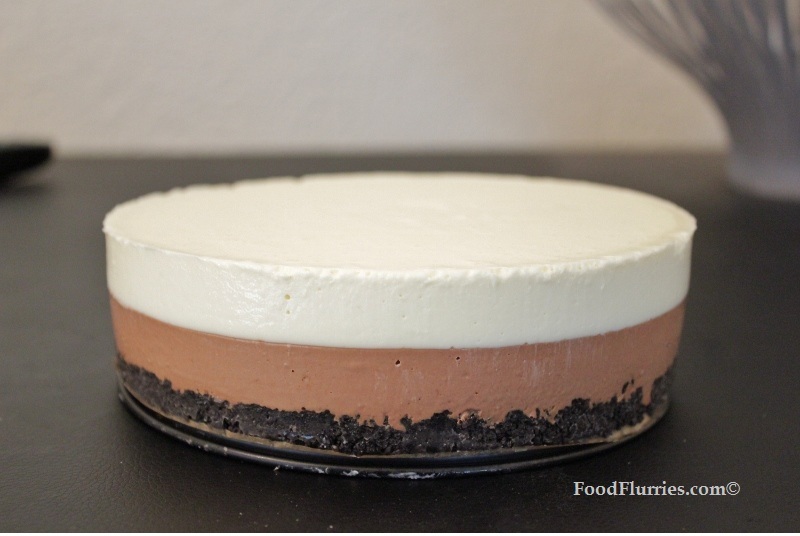 The filling is a two-part process, since you will be making two different layers of chocolate cheese filling. Let’s start with the milk chocolate layer first. Both the steps for making the milk and white chocolate filling is the same, just using different chocolate flavours. In a microwave-safe bowl place the cream and chocolate chunks. Zap everything in the microwave for 1-minute. Remove and give it a gentle stir to evenly distribute the heat. Place it back in the microwave, this time for 30-secs only. Repeat these steps until all the chocolate has melted and it forms a smooth ganache. Now this is the time to add the gelatin leaves as the residual heat from the gancahe will melt the gelatin. Stir it in thoroughly to ensure an even distribution and no clumps. Set aside to cool. For the cream cheese filling place the room temperature cream cheese, condensed milk, sugar, cream and vanilla extract in a mixing bowl. Beat with electric beaters until mixture thickens slightly. Now pour in the melted chocolate ganache and beat until just combined. Scrape down the sides with a rubber spatula and stir until there are no streaks left in the bowl. Remove the tin from the freezer and pour everything into your tin. Give the tin a gentle shake and a tap to settle the mixture; tapping the tin on the work surface will get rid of any air pockets within. Return the tin to the freezer to chill and set up before adding the white chocolate layer. To prepare the white chocolate layer, just repeat the steps as mentioned above, substituting milk chocolate for white and minus the vanilla extract. Once the white chocolate layer has gone on, shake and tap the tin and then place in the fridge for a minimum of 4 hours, but for best results I like to keep it in the fridge overnight … which makes this a great make-a-day-ahead dessert for a party. The next day carefully unmould your cheesecake from the tin and decorate with some whipped cream and chocolate decorations. And just like that you have a stunning dessert to wow your friends with at your next get together! 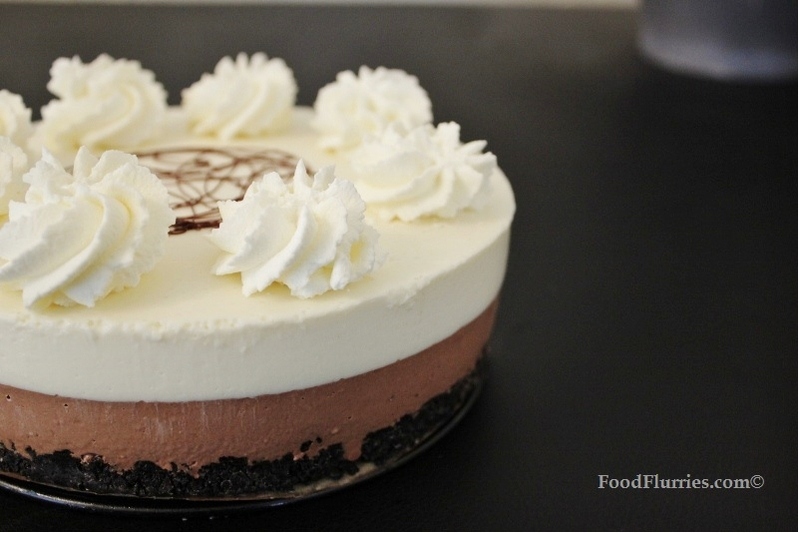 This cheesecake would do very nicely for a festive event like Valentine’s Day or for Christmas since it is rather rich and decadent ~ simply decorate it accordingly and enjoy the indulgence. 2. Mix with melted butter until you get a consistancy of wet sand. 3. Place the crushed cookies in the bottom of your greased and lined 8-inch round springform pan. Press firmly, either just on the bottom of the tin or up the sides as well. 4. Place in the freezer to chill and set. 1. 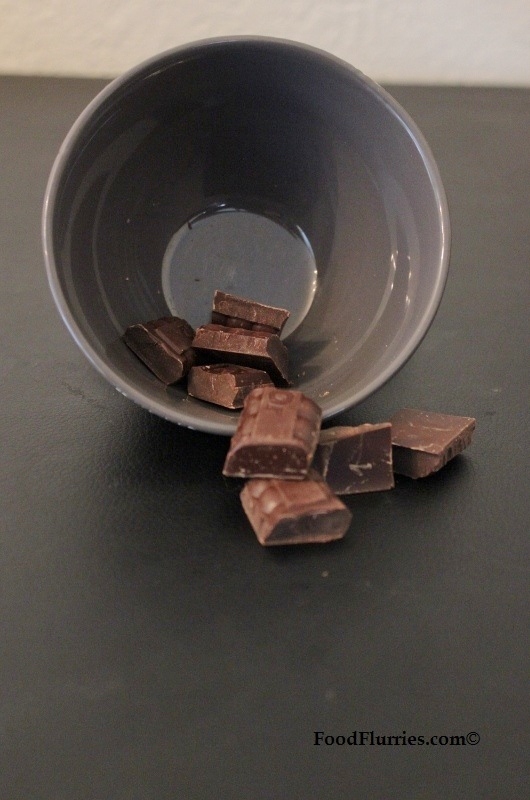 Place the chocolate and a quarter-cup of cream in a bowl and microwave for a minute. Remove and stir until smooth. Add the pre-bloomed gelatin and stir again until completely dissolved. 2. In another bowl beat cream cheese, the other quarter-cup of cream, sugar, vanilla and condensed milk together until mixture thickens slightly. 3. Add the melted ganache to the cream cheese mixture and beat until just combined and there are no more streaks. 4. Remove the tin from the freezer and pour the chocolate cheese filling in. Return to the freezer to set … wait about one hour. 2. In another bowl beat cream cheese, the other quarter-cup of cream, sugar and condensed milk together until mixture thickens slightly. 3. Add the melted ganache to the cream cheese mixture and beat until just combined. 4. Remove the tin from the freezer and pour the white chocolate cheese filling in. Shake and tap the tin lightly on the work surface to settle the mixture. Place the tin in the fridge for a minimum of 4 hours to set, but for best results I would suggest you chill it overnight. Viv, I loved this cheesecake, so beautifully decorated. Very light I could have eaten the whole thing! … and you could have had the whole thing guilt free coz this particular one was made with lowfat cheese. So happy everybody liked it. Made my day as well. I love you! Words can not describe what the addition of this cake has done to what has other wise been a terrible day! I can not promise it is easy to make for I have not made it but if you want to make someone happy this cake is the way to go!!!!!!!! This was superb! Rich and flavoursome, yet light and tangy- great contrast in flavours and textures. I was very lucky indeed to have tried this cake! Thanks Viv. You are very welcome, Brent. It was my pleasure. Nomnomnom is right! If Liliana didn’t ask for it to be sent to the office Rob would have eaten it all. I am very happy you like it. Should have made a bigger one, eh? GOOD LUCK!! I hope it turns out well for you.